Monte Booker is one of the music’s most sought-after producers right now, and for good reason, as his otherworldly style isn’t only worlds away from what everyone else is making right now, but it’s also levels ahead in sound, feel, style, and everything in between. 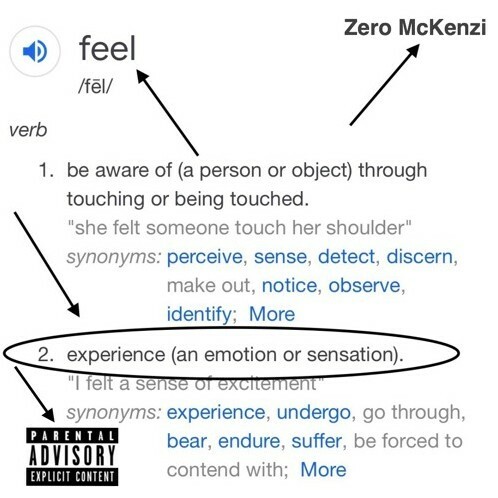 Needless to say, hopping on a Monte Booker beat is a daunting assignment, but an artist named Zero McKenzi has successfully done so with his latest offering, “FEEL!”. Noted by the cover art, which features a definition of the word “feel,” this offering is all about making listeners feel something. Zero certainly succeeds at this mission, as the heartbreaking beauty of lines such as “my home doesn’t feel like home” take listeners to a dark place, using the electric production as a cathartic backdrop for such honest, candidly depressing lyrics to take place. “FEEL!” isn’t simply a canvas for Zero to dump all of these thoughts, however — rather, he takes this introspection to another level by describing the ways in which we, as humans, tend to pick ourselves up and keep moving, even as the sadder things weigh us down. Being that this song is my first introduction to Zero McKenzi, I must say that this release is deeply impressive, displaying a level of songwriting and overall creative direction that I’ll definitely be looking out for in the future. Zero has something to say, and he’s going to say it — just listen to “FEEL!” for proof!